Priscillas: Everything's Coming Up Daisies ! Good Morning ! I hope all you Mom's had a wonderful Mother's Day ! I saw this galvanized tiered tray on Instagram ..It came from Sam's club for $24.00..I have wanted the pottery barn version which is so much more expensive for a while so we ran to our Sam's club to see if they had them .. 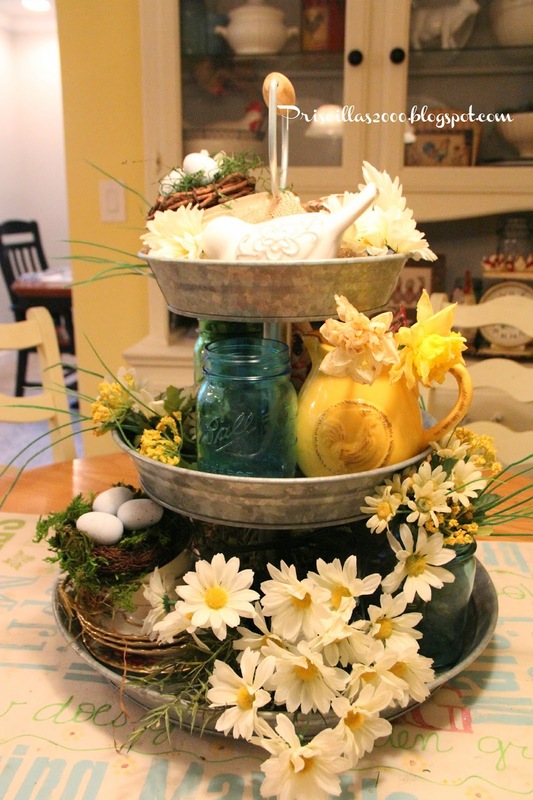 I filled mine with daisies , mason jars, cups and saucers with birds nest , a little chicken pitcher , birds and greenery .. I have so many ideas of how to fill it for the coming seasons ! 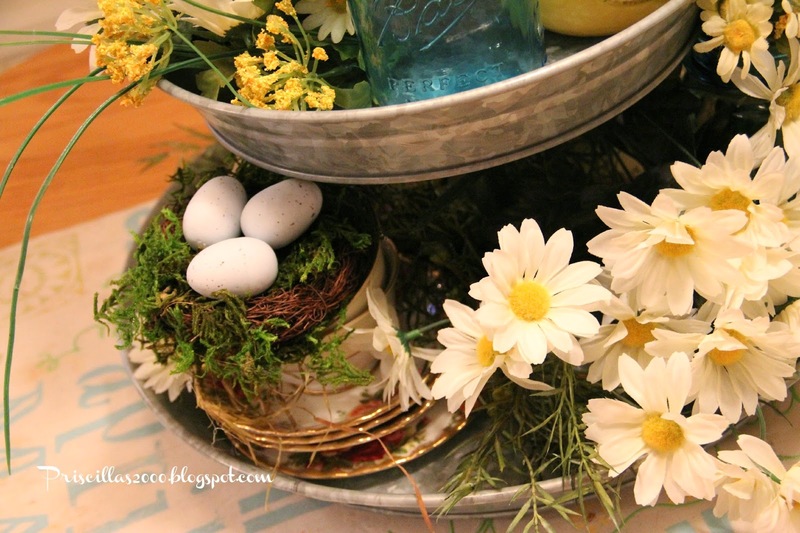 I also added some daisies to the vintage scale vignette on my kitchen counter..A yellow check tea towel and a hydrangea in a mason jar..
Love all the daisies with the yellow in the kitchen ! OH MY!! I just saw this very thing at our SAMs last weekend, I didn't buy one, but I've been thinking about it for the last week! LOL! Love how you arranged it! My son gave me the PB version for Christmas. I'm looking forward to your other arrangements! Wow...love it. You styled it perfectly! 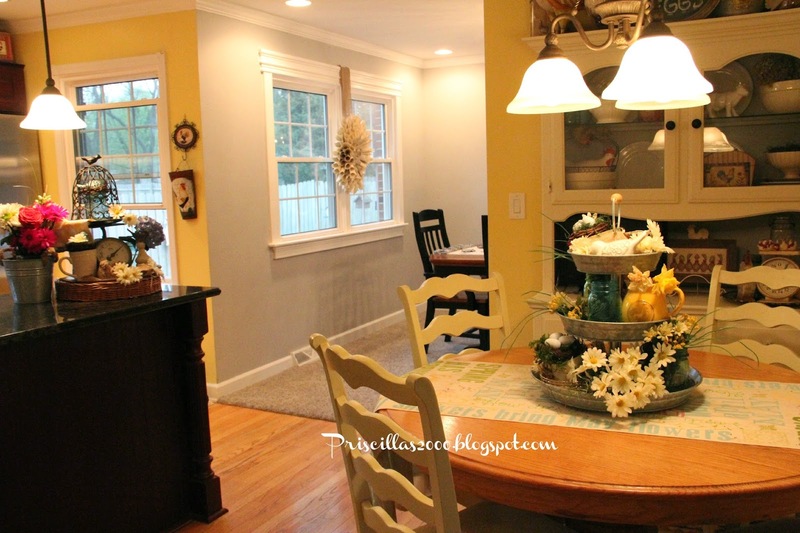 I agree, the daisies look just right with the yellow in the kitchen. Your new tiered try will be great for many seasons. It will be fun thinking of new ways to use it. Very pretty! 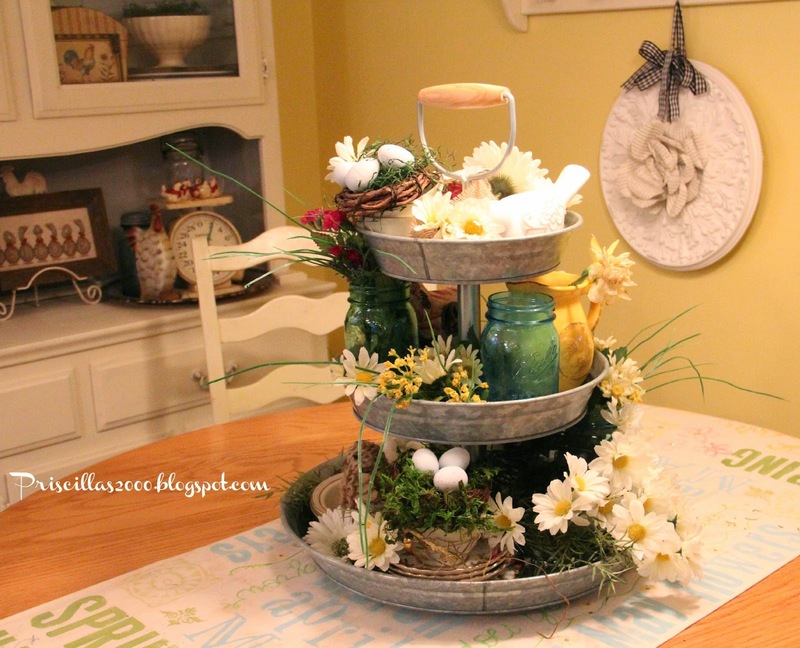 I love this tiered tray, and have almost had it in my cart a few times! Love the daisies too!! Its beautiful, you have such brilliant ideas, love all the yellow, so fresh and pretty. Look forward to seeing it change through the year. Is SAMs a crafty type shop?? bought this last week at Sams and love it. Now I love it more with this idea for using it. I have just been using it for my vegetables. I have been dying to have one of those tiered servers, I just love all the different elements you've used, so fresh and pretty! Oh I love this arrangement, so pretty and perfect for spring. Thanks tons for linking to Inspire Me. Love that piece and would like to have one as well but we do not have a Sams membership. Oh well. Thanx for partying at THT! Oh man! I have a BJ's membership, not Sam's club! 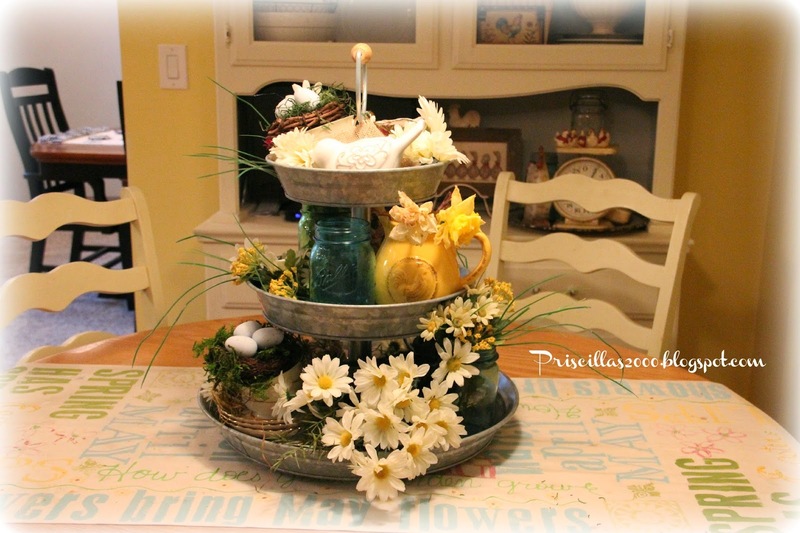 I love your centerpiece and daisies are my favorite. 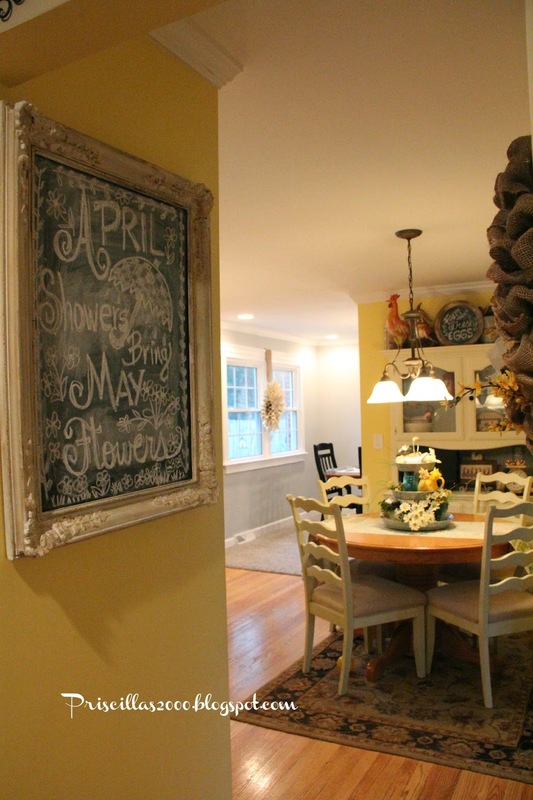 What a pretty yellow kitchen! Well I would have scooped up one of those too! 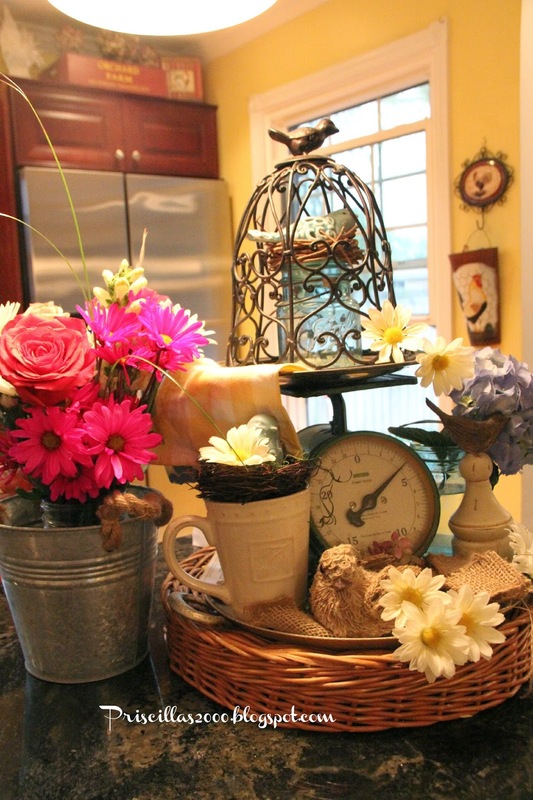 Love the ball jars and daisies - these are a few of my favorite things - can't wait to see what the coming seasons bring - what a great versatile piece. Kudos! Love that stand Priscilla! I have wanted one for a while also. Must see if Sams still has them. You created such a darling display for the summer months. Love it! Thanks for sharing with SYC. Hi Priscilla, featuring you at SYC this week.